Malaria is a serious tropical disease that causes thousands of deaths every year, yet it is both treatable and preventable. Many countries are currently in the process of trying to rid themselves of this deadly disease. Cambodia is one such country, and Pengby Ngor, a young Cambodian scientist and a member of TDMODNET is at the forefront of this work. 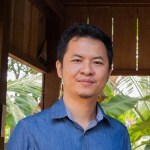 He works for the Cambodian National Malaria Center (CNM), based in Cambodia’s capital city, Phnom Penh. His smartphone app can allow health facility staff and VMWs to send malaria data to the national program in real time. The smartphone app and the VMW scheme are exactly the kinds of novel approaches to community health that are needed to assist Cambodian scientists and health workers in monitoring outbreaks of malaria, information which is essential if the country is to successfully eliminate the disease.